I already wrote about the hair products from keune. Then I tried out an awesome shampoo & conditioner for colored hair. But this time it wasn’t me that tried out a product… But my boyfriend. Because from keune I also got there shampoo stick for men for hair and beard. So time to tell you what my boyfriends thoughts are about this shampoo in stick form! I never saw a shampoo in stick form before. But if you think about it, it’s very logical. Because a bottle with shampoo can spill in your sport bag or… So bye bye bottle with shampoo that also takes much place in your bag. And hello to the shampoo stick that doesn’t spill and don’t take too much place in your bag! Handy, easy and innovative to take with you in your sport bag or when you’re traveling. This is easier than you would think! You rub the stick over your wet hair. And then you just massage the shampoo like you normally do. Is it handy? My boyfriend thought not… He has thin hair and for his thin hair he needed a lot from this product before he could massage it into his hair. And yes, this takes some extra time. This shampoo stick is handy to take with you. But it does take some extra time to bring it on your hair… But then you got something! Because the stick smell so fresh! A good male smell! Because this shampoo doesn’t contain SLS it is a mild shampoo. And for my boyfriend is this just what he needs! He has thin hair and a very dry scalp. But this shampoo works perfectly for him, it let his scalp feel less dry. And his hair also looks better and with some more volume. Ok, it takes a bit longer to apply this then a regular shampoo… But my boyfriend find this product worth the extra time. So this shampoo in stick form from keune is for sure amazing for my boyfriend his dry scalp and thin hair. 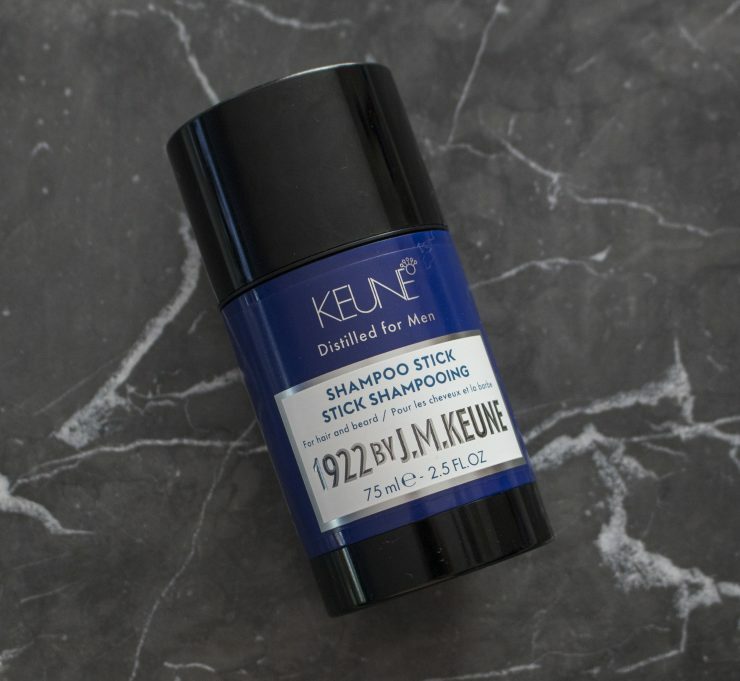 This shampoo stick from keune is available at the keune salons and the price is €17,75 (75ml).